KWAJALEIN, Republic of the Marshall Islands (Nov. 15, 2010) -- During a trip to the Army's Ronald Reagan Ballistic Missile Defense Test Site on Kwajalein Island for Veterans' Day, the U.S. Ambassador to the Marshall Islands participated in a ceremony to recognize military veterans past and present. On Kwajalein Island, the largest of about 100 isles in the Kwajalein Atoll -- located some 2,100 nautical miles southwest of Honolulu -- Ambassador Martha Campbell addressed many of the active-duty Soldiers who serve there as well as the many veterans among the nearly 1,000 contract employees and Department of the Army civilians on the island. 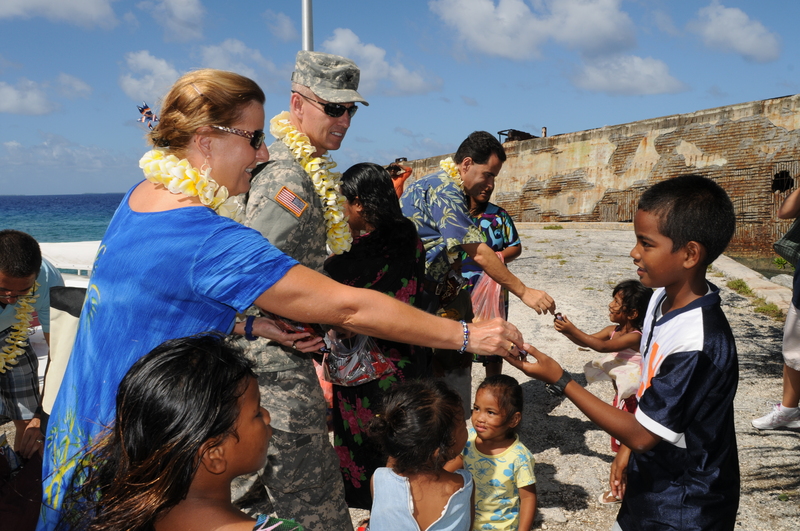 Martha L. Campbell, U.S. ambassador to the Republic of the Marshall Islands, visits with children on Carlos Island, in the Kwajalein Atoll, Nov. 11. "Thank you very much to the veterans, both Marshallese and Americans -- there are a lot of Marshallese in the U.S. military -- so thank you very much to those veterans and the active-duty folks," she said. The ambassador also laid a wreath at the Operation Flintlock Memorial on the island. Installation commander Col. Joseph N. Gaines hosted the ambassador on a trip to the island of Carlos -- a neighboring isle in the atoll. Just a short boat ride from the Kwajalein docks, Carlos Island serves as home to sensor equipment that once served as an important part of the mission at the Reagan Test Site. Changes to the Army mission on the atoll will affect change on Carlos. For instance, in the future, the Army is looking to scale back activities there. When the Army stops fueling the generators that power the ageing antenna array on Carlos, for instance, there will no longer be electricity on the island. About 70 Marshallese currently benefit from that power source, but Campbell said other places in the Marshall Islands are able to provide their own power, and she hopes the same could be done at Carlos. "The U.S. would like to see the Marshallese become more self-sufficient," she said. While at Carlos, Campbell paid a call on the Carlos Public Elementary School. Students there learn English as part of their schooling -- though Marshallese is their primary language. "In theory they have been teaching English to children from very early grades, but the students can't speak English, mostly because their teachers don't speak English," she said. "It's one of the things that is really going to hold back the Marshall Islands from joining the world community -- there aren't very many people who speak Marshallese in the world." The U.S. and the Republic of the Marshall Islands enjoy a unique relationship in that they are signers to a Compact of Free Association. The Compact provides special privileges to Marshallese that citizens of other nations do not have. "The citizens may go into the United States, study, work, and live without a visa. That's pretty unique in the world," Campbell said. "Also, we give about $60 million a year in direct Compact funding. Plus, they have access to a lot of U.S. domestic programs to which other countries don't have access." Some of those programs include Health and Human Services, the U.S. Department of Agriculture, the Department of Energy, and the National Oceanic and Atmospheric Administration. Among the highest priorities for both the United States and the RMI is health and education in the island nation, Campbell said. Campbell said the Marshallese have done a good job building new schools with money from the Compact. Almost 200 new classrooms have been built across the RMI over the past few years, including a new eight-room elementary school that just opened in nearby Alinglaplap, for instance. One of the biggest challenges in the RMI is helping the nation become economically self-sufficient. There are about 60,000 citizens throughout the Marshalls, and the largest employer of those citizens is the government of the Marshalls. The second-largest employer is the U.S. Army Kwajalein Atoll/Reagan Test Site. Campbell said the Marshallese do have a fledgling fishing industry with the potential to look into tourism -- with the caveat that the islands are distant from population centers. Now, she said, byproducts from coconut harvesting -- called copra -- fuel trade on the islands. Copra can be used to make oils, for instance. Right now she said there's also a study being funded to see if copra can be used for fuel. Availability and cost of fuel is also a problem for RMI, as is transportation. The ambassador also said that climate change is a concern for the RMI. "It doesn't take very much to make them disappear. The high point on Majuro (the capital of the Marshall Islands) is ten feet above sea level, and that's the top of the bridge connecting two islands," Campbell said. "We are supporting a lot of disaster preparedness planning for the Marshall Islands." Despite problems in the RMI, the nation remains an important ally to the defense of the United States, said Campbell, due in part to its strategic position in the Pacific and to the Reagan Test Site which is located there. "(The Marshall Islands) are sort of the border of the United States, in a sense. The next thing over is Hawaii. So I think it's important for us," the ambassador said. In Kwajalein Atoll, the Army offers some assistance to RMI civilians living on Carlos and neighboring islands such as Ebeye, the most populated island in the group. But Gaines said it's truly up to the government of the RMI to take care of its own. "When we go to Carlos and see problems there, it is up to that independent sovereign nation, their responsibility to their own people," said the installation commander. "We can assist, but it is their responsibility." But Gaines said its part of his "good neighbor policy" to assist the neighboring islands when there's trouble. Water shortages on Ebeye, for instance, can be helped with shipments of fresh water stored at Kwajalein. And power outages can be fixed with the temporary loan of generators. Gaines said there's a baseball game scheduled soon between the civilians and Soldiers of Kwajalein, and the islanders on nearby Ebeye. The game is scheduled to be played on Ebeye, an island about a quarter mile wide and 1.5 miles long -- with a population of approximately 15,000. Gaines acknowledged he could have arranged the game on his own field at Kwajalein -- where his players would have enjoyed a home field advantage. But Gaines has a reason for wanting to play the game on RMI's field. "We can leave our equipment there when we leave," he said. "That's being a good neighbor."